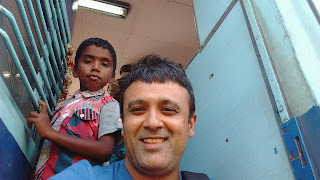 Straight from the heart: Hello Karthik! ‪#‎TravelTales‬ ‪#‎Tamilnadu‬ ‪#‎ThanjavurToTrichy‬ ‪#‎Railway‬ I had a window seat. However, it was occupied by a lady – maybe they were traveling as a family. They offered to vacate it but I just flung my luggage under the seat, asked them not to vacate my seat and went to occupy my favorite place – the doorstep of a running train. I was traveling from Thanjavur to Trichy. After a while when I looked back, I saw another family sitting on the opposite doorstep. They were four – husband, wife and two kids. I was sitting at the doorstep by choice as I still had a ticket to occupy my berth. Probably they were sitting there due to compulsion and didn’t have tickets. After a while, he came to me and asked something in Tamil. I smiled and gestured with hand and said “No Tamil”. He said something in Tamil and went back. He went back only to come back in another five minutes and asked “What is your XXXXX”. The last word was in Tamil and I didn’t get it. He repeated thrice and went back disappointed. Then I took out camera to take few pictures from the doorstep. Again comes Karthik inquiring about the camera. I showed him how to take a picture and took a selfie. Well, he asked for it smile emoticon I showed him the selfie and he went back happily. Trichy came soon and I parted. What I figured out is today’s kids are not at all shy to approach a stranger. Even those kids who are from village or towns. Gone are days from my generation where we used to avoid strangers or hide in a room when guests used to come home. He shared and shared with a smile. This was probably the only instance in my trip where I got something for free, without asking. I also experienced difference between over pampered city kids who are difficult to manage in a tour due to their liking, disliking, wants, needs and almost everything that is showered upon them by their “new age parents” who thinks that’s the only way to ensure their child is special. I do not have a kid but I have many kids who are my friends. I also volunteer every year at my office when we celebrate “Bring Your Child To Work” day and I spent an entire day with over 750 children. So I know at least a couple of things about city kids. This small town boy’s eagerness, simplicity, willingness to share and smile was so refreshing!